Erik Weihenmayer gazes into the distance from the top of Mt. McKinley. From the Editor: Last May many of us found ourselves constantly preoccupied as we went about our daily tasks, turning frequently to the Web site chronicling the NFB Allegra 2001 Everest Expedition. I found myself calculating a dozen times a day the time on Mt. Everest and wondering what dreadfully difficult thing our team was attempting to do at that moment, what impossible weather conditions they were enduring, what complication was springing up to make their lives more difficult. But as everyone now knows, on May 25, 2001, nineteen members of our expedition summited Mt. Everest, breaking several records. 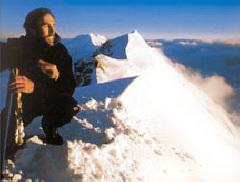 For members of the NFB the most important facts were first that Erik Weihenmayer had made it to the top, demonstrating in yet another powerful way that blind people are capable of doing extraordinary things when given the chance to try, and, second but equally important, that everyone in the expedition was safe. Moreover, the team returned safely to the United States despite their bone-weariness and a political crisis in Nepal. Thanks so much. I'm really touched; what a response. That's great. It's so good to be home among friends and family and nice warm Philadelphia. On Everest it's so cold that one day my eyelids froze together. It didn't really matter, but it was sort of strange. It's just so great to be home, and it's good that we were successful. As you may know, before Everest I had climbed mountains all over the world and had great friends and great teams that had helped me get to summits. I have a friend whose name is Chris Morris. He's from Alaska, and he's got these wonderful Alaskan witticisms. We had climbed Mt. McKinley. When we came down, we climbed into our igloo, which we had built at about 17,500 feet. Now, when people climb mountains, they get all sorts of illnesses. Their lungs fill up with fluid, and their brains swell up. All sorts of terrible things can happen to you. The thing that happens to me is that I get nauseated, and I throw up. I have thrown up on mountains all over the world--sort of my claim to fame. But we ate a big pot of freeze-dried spaghetti in our igloo, and I immediately gave it back to the mountain gods. So now my friend Chris had to crawl through it to get out; you know, there is only one way out of an igloo. As I said, he has wonderful sayings. My favorite is, after I'll say, "Chris, I'm pretty tired. How far do you think it is to the next camp?" he'll say something witty like, "Well, it's hard sayin', not knowin'." He has one he calls posi-pessimism. It's sort of a philosophy of his. You're sitting out in a storm, and he'll say, "Sure is cold, but at least it's windy." "Sure have climbed a long way, but at least we're lost." I said, "Chris, you're a philosopher for very simple people." Then one time I was teasing him on a climb, and I said, "Chris, you may be slow, but at least you're dumb." Chris was with me on Mt. Everest--he was one of the real strong climbers on our team. When I was thirteen, I became blind from a rare disease, retinoscheses. There were a few months of frustration when I wasn't really sure what I'd be able to do, but something interesting happened. I didn't really want to accept blindness and accept myself as a blind person. I didn't want to be identified as a blind person, but I found something interesting: when I actually accepted blindness--I didn't try to transcend it or go beyond it or beat it but just accepted it--that was the greatest thing I could ever have done. I went off to a rehabilitation center where I learned how to use computers, a center like the Colorado Center, the Minnesota center, or the Louisiana Center, and learned how to use a cane and learned Braille. I found that, when I was able to read a poem in Braille in front of my class or was able to walk down a hallway with a cane with my buddies, those things that I thought would separate me actually connected me back to the world. I started thinking, if I thought I couldn't read, but I can and if I thought I couldn't be mobile, but I can, maybe there are other things that I can do that I didn't think I could do, if I just approached it differently, if I thought about the idea that we can get to the top; we just have to do it a different way. So my dad suggested that I go rock climbing. He said, "There is a program for blind kids going rock climbing." I thought, "That sounds crazy," so I signed up. They were teaching us that you didn't climb with your eyes, you climb with your hands and your feet. Your hands and feet became your eyes. You could scan your hands and feet across the face, and you could find your hold and do a pull-up and reach up and scan your hands again, and it was like I was creating this road map in my brain as I reached out and found the holds. It was like connect the dots. That led me to all sorts of different climbs. I thought I could ice climb. People said, "No, Erik, it's different from rock climbing; big giant pieces of ice will come down on top of you." Well, I learned to climb ice by the sounds that I would hear under my tool. Part of me was a little worried because I was pretty sure I had the skills. I had been climbing for years and years, and I thought, "I'm ready, but maybe they know something I don't know." Then the other side of me said, "They are just wrong. They are judging me on the basis of one trait. They know nothing about me except the fact that I'm blind." That side of me was sort of offended. So I decided the best response was to go climb Mt. Everest. Well we climbed Ama Dablam, and we got turned back by a storm, and we ran out of food and fuel, and we had a climber fall 150 feet--not such a great start for our adventure. But that day on Ama Dablam we came down through a twelve-hour storm as a team. People were helping each other carry loads through this section of the mountain that we had sort of nicknamed Abject Terror. We all came down to base camp together. I thought that was so great because the idea of this wasn't just to drag a blind guy to the summit and spike him on top like a football. That's against what we're looking for here. The idea was to create an integrated team, one of whom happens to be blind, a team where everyone contributes to the overall success of the team. We were able to do that. We worked through adversity, and we found our strength as a team, and I thought we were really ready. So the next year we left for Mt. Everest, about four months ago. It was a long trip, and it was definitely head and shoulders harder than anything I had ever done. The hardest section is called the Khumbu Ice Fall, a 2,000-foot section of jumbled boulders, where the glacier is running down, and it just drops off a cliff and tumbles into the valley. So there are ice boulders from the size of baseballs to the size of skyscrapers, just piled on top of each other. There is no rhyme or reason. There are vertical sections. You're weaving in and out of the ice. You're jumping over crevasses that are hundreds of feet deep, where my long trekking poles couldn't feel the other side of the crevasse. I just had to trust where I was jumping and my crampons. There were three and four ladders that were tied together that spanned these huge, wide crevasses that you couldn't jump over. I learned how to balance my weight over the ladder and get the points of my crampons, which are under my feet, locking them over the rungs and staying balanced, and be able to walk across those ladders. Sometimes they were swinging in the wind as you walked. Then, as we got higher up the mountain, it got steeper, and I was in my element, because I was either kicking steps or I was following the kick footsteps of people in front of me. They would hike in front of me jingling a bell, and I was pretty much following their footsteps and the sound of the bell. On summit day something strange happened. We left at about 8:45 at night, so most of the climb was in the dark. The sighted team members were struggling to breathe. We all had oxygen masks over our faces, and those masks cover most of your face. The oxygen in the mask is constantly fogging up your goggles so you can't see out of the sides. I have been told that sighted climbers can barely see their feet. They had these little head lamps on, so there was just a trickle of light. So everyone was in the same boat. It got so much harder for everyone else, and it sort of stayed the same for me. It almost got easier. So we climbed steep rock, steep snow for many hours until about two in the morning. We were stopped by a white-out, a bad storm, and it was windy. We thought we were going to have to turn back because you really can't push forward in the face of the wind and the snow like that, but a team member looked up, and he said he could see a star. On the basis of that we proceeded a little bit further. The entire time we wanted to make sure we never sat down. Our climbing leader Pasquale said something important to us before summit day. He said, "Don't sit down. If you do, you won't get up." So we had to make sure we were moving hard the whole day. My teammate Jeff--and this is how I know a good friend, because I was nervous. There was a storm coming in. Our team leader down at base camp was yelling, "Get down. There is a storm coming in. You're only half-way there. You gotta get down." Jeff said, "Erik, stop and reflect a moment. Look around and think about what you've done and where you are." So I did that for about thirty seconds. I don't climb because I want to prove anything to anybody. It's like, if you paint a picture, you don't paint a beautiful picture because you want to prove to the world that you can do that. You paint it because it's beautiful. You love it with a passion. But there wasn't anything wrong with responding to those cynics and those critics by standing on the top of Mt. Everest and then coming down with no frost bite, all our fingers and toes, not even sunburned. A few people may have the privilege of getting to the top, but it takes an entire team to get them there. It takes people on a mountain fixing lines, spanning ladders over crevasses, carrying loads, and organizing base camp behind the scenes. I want to thank all the people, the staff at the NFB, and all the folks at the local chapters who have been praying for us. I could truly feel that on the mountain, and it really helped. Barbara Pierce, thank you so much, Dr. Zaborowski, Dr. Maurer, Maurice Peret--who by the way was ready to head to the summit anytime I got injured--and everyone. I could go on and on. I am so proud to be a Federationist. I am so proud that we were such an amazing team on that mountain. We did it together. Thank you.